We are a few days away from entering October 2017. This summer has been quite eventful, and I would like to share it with you. This past month was all about the great move. Moving with 3 kids is definitely a challenge. My wife and I want our kids to move to a place where they can have good space to have fun and good school to go to. I also needed to find a place with good space for my studio. We were truly blessed as we came across a wonderful place within the school district that we like. The owner converted 1/2 of the garage to a studio space which is perfect for me. We made the move in a very short period of time, so it really drain us out. But seeing my new studio space and got everything setup got me really pumped to create more content! My online course was launched this month. This definitely took a lot of time and effort to produce during this summer. There are quite a bit of launch content for students who enrolled the course. However, I have no intention to stop, there are a lot more content I want to add to this course. With the new studio and video equipment setup, I will be able to start producing the additional content. There are many more topic I want to cover, but the first piece of content I want to add is visual language. "How to do a loose painting" is the number one question that I received. And I believe the development of visual language is the major factor of this. 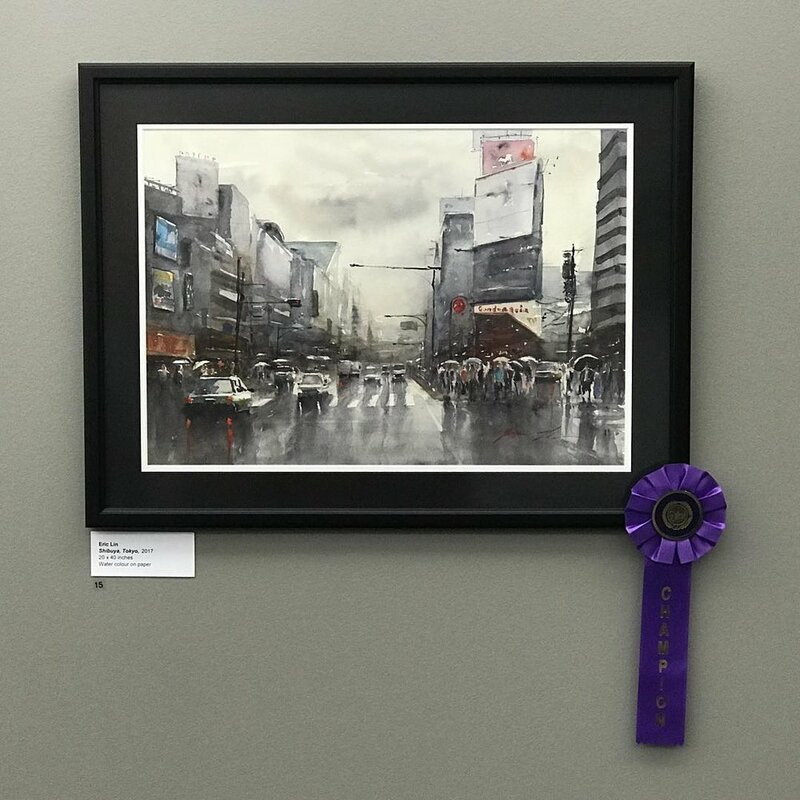 My painting- Shibuya, Tokyo has won the Best in Show at the employee art show in Microsoft. I am extremely honored and humbled by it. There are 6 Juries in this show including some great artists and gallery owner. It was during the frightening time when the Hurricane Irma hitting the east coast. I decided to donate the wining piece to the Microsoft annual charity auction. I hope the painting will find a good home, but more importantly, I wish the money that's going to raise will contribute to help the people in need. As I am writing this, my YouTube channel subscribers had grown into 11,446. As a celebration and appreciation for your support, I decided to do a giveaway! Just go to the video, like and leave a comment about the most important tip you have learned from any of my video. I'm really exciting of what's coming to Café Watercolor in the near future. I appreciate you and your support throughout this year. I can't wait to share another painting, blog post or video with you!